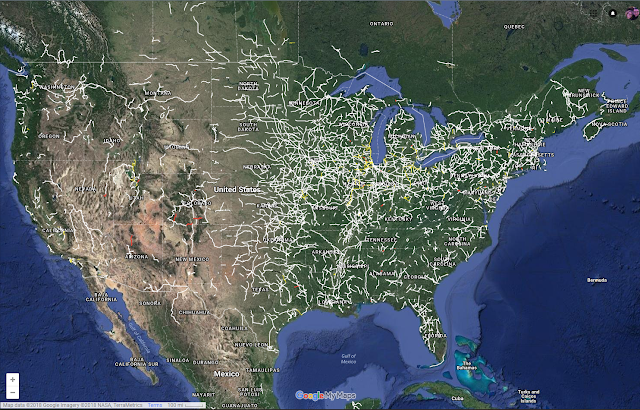 My Google Map of abandoned railroad corridors across the world has gotten a ton of views and support from people across all sorts of interests and knowledge bases. For that, I thank you. But I never really explained how I came to find all of these lines. So with that in mind, today's blog is going to go over how to use Google My Maps to create your own maps for people to find and view and criticize. Step 1) Use an online satellite map to find rights-of-way. These are extremely easy to find, as they’re pretty much everywhere. My map uses the Google My Maps UI. MapHub is another tool you can use, although I personally find Google My Maps easier to use. This tutorial is going to use My Maps and some tools I find useful for finding railroad lines, both visible and invisible. 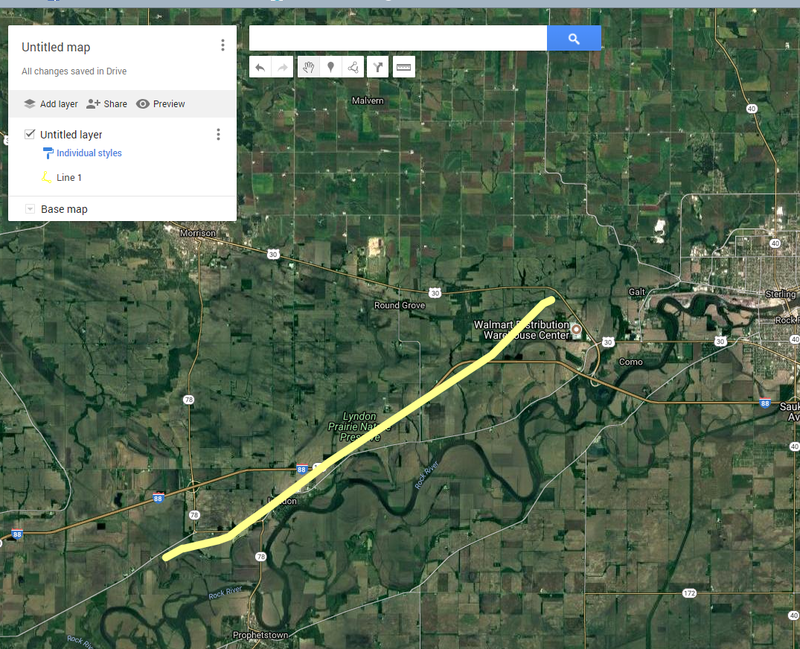 For the tutorial, we're going to trace a line on Google My Maps. From the Google My Maps page, on the top left, clicking on the menu will allow you to select "Create a New Map"
From the menu on the top left, selecting "Base Map" will allow you to select different base maps, including satellite view, which will be necessary for finding rights-of-way. So, let's go to my home state of Illinois and find some of these abandoned lines! From this location, we can easily tell that the lines which connect today once continued on in their respective directions from this junction. Clicking draw a line on the top will draw a line. Moving the cursor will also move the map, and if not, you can also manipulate the map in this mode using the up, down, left and right buttons on your keyboard. Following the northeast right-of-way, it's pretty easy to tell that this line went to a junction with another railroad at Agnew, IL. Once the line is created, it will appear as "Line 1" in an "Untitled Layer" on the map. Clicking the right side of this line will allow you to change it's color and the width of the line. You can also change the color and width of multiple lines at a time clicking on "Individual Styles" in the Untitled Layer. I made a very wide yellow line for this tutorial. Click anywhere on the line and a dialogue box will appear, allowing you to change the size and color from there, and edit the name of the line, which we will do in a second. A right-of-way is good, but what if we wanted to know more about this line? We know it went to Agnew and through Lyndon, and knowing that bit of information, we might be able to search for info on Google, or on a Facebook group, but what if all we knew was the beginning GPS coordinates? HistoricAerials.com and The USGS Historical Topographic Map Explorer are invaluable tools for learning about abandoned railroads, and finding ones that otherwise have little or no visible right-of-way today. Each allows you to search with GPS coordinates or location, just like Google Maps. Knowing we started at 41.70034, -89.97682, we can use HistoricAerials to find satellite and topo maps from any time period that topo maps exist. In this location's case, it's 1932. In this case, we can easily tell that this is a former Chicago Burlington & Quincy line, and that the junction was once called Denrock. The abandoned line heading southeast from here was also a Chicago Burlington & Quincy line. Another great resource is the Open Railway Map. This has more rights-of-way than can be found on topo maps, but does not usually have good information on the line, when it was abandoned and what company ran it. 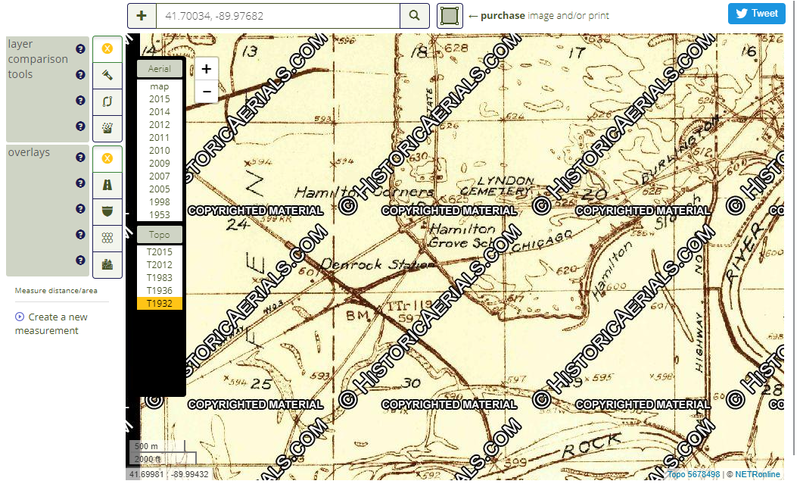 While topo maps help the best, they are far from the only resource for abandoned railroad lines, and they don't always have what you're looking for, but to list every resource would completely take up this blog! There are many fan websites, Facebook groups, magazines, and printed materials that would be of interest to those looking for abandoned railroad lines. The Denrock to Agnew line was the first that I traced, and thus the beginning of this wonderful project. There are thousands upon thousands of abandoned railroad miles in the world, not just in the US. There's plenty of corridors to find both at home, abroad, and in places you'd least expect. If you have any questions or believe I need to add something to this tutorial, please let me know, and as always, thanks for reading!